Since we're closing in on Valentine's Day, it seems like an appropriate moment to review Penhaligon's LP No. 9 for Women, which is characterized as "a truly intoxicating love potion...a sorcerer's recipe for irresistible female sensuality." This fragrance, and its counterpart LP No. 9 for Men, were originally released in 1998; they were discontinued in 2006 and made a re-appearance in late 2008. LP No. 9 for Women, which was reportedly brought back in its original formulation, was created by Christian Provenzano. Its composition is listed as having top notes of lemon, mandarin, lavender, bergamot, geranium, and tarragon; heart notes of rose, jasmine, and carnation; and base notes of cinnamon, cedar, patchouli, amber, musk, and vanilla. LP No. 9's name, of course, is a nod to the classic pop song "Love Potion Number Nine," first recorded in 1959 by The Clovers and later covered by The Searchers (among others). Penhaligon's traditional bottle is trimmed with a twist of black velvet ribbon for LP No. 9, and the liquid within is a fascinating magenta hue. This appearance sets LP No. 9 apart from some of Penhaligon's earlier releases for women, which tend to have Edwardian-style labels and a garden-party aesthetic. But does LP No. 9 smell so very different from those more traditional fragrances? Yes and no. Its opening notes, which last for the better part of an hour, confused me at first. This dry, herbaceous accord, with lots of lavender and greenish notes — and, wait, is that oakmoss? — feels like a lighter interpretation of a traditional fougère, and it would not be out of place in Penhaligon's masculine fragrance range. All in all, I would dub LP No. 9 a "herbaceous floral," and I think it would appeal to fans of Penhaligon's Bluebell or Violetta, both of which combine spring-flower notes with layers of greenery and/or spice. It's quirkier than it sounds in its official description, and it's not what you might typically expect from a "romantic" fragrance (no noticeable rose, no tuberose, no gourmand notes). Sometimes, something unexpected is the most bewitching option. Penhaligon's LP No. 9 for Women is available as 50 ml ($80) and 100 ml ($120) Eau de Toilette. For purchasing information, see the listing for Penhaligon's under Perfume Houses. Note: top left image is Aubrey Beardsley's "Isolde" [cropped], via Wikimedia Commons. Robin, this was completely off my radar screen, but your review has convinced me that it’s one I should try. Doesn’t Penhaligons have a sampler set? I still need to try Bluebell and others. And buy Amaranthine, but that’s a different story! H, they used to have a sample set… not sure whether they still do! Jessica! Sorry! Teach me to not read the byline. I have the 1998 version which is basically Dune by Dior. The one for men smells like Opium pour Homme. Really? That’s intriguing… I’ll need to try them side by side. When i read the list of notes, i though “that’s a love potion?” Still not convinced, but it does seem interesting as a scent. I haven’t had a lot of luck with Penhaligon – even Amaranthine was amiss for me, alas! BTW, I love white flowers and woods, but would have hidden the “Camp Beverly Hills” bottle as well. Maggie, it’s not what I expected from the description. It’s like one of those romantic comedies in which the woman and man start by arguing and end by kissing! What a blast from the past! I can remember listening to Love Potion Number 9 on the radio in Jr. High! I hadn’t thought about that song in years. Somehow I’ve missed all of the Penhaligons – even Amaranthigh! And the fougere aspect doesn’t necessarily entice me to try this one – but still, good review, Jessica (you’ve been busy). Thanks! R, I’m still working my way through the line, myself… they were hard to find for a while but now they’re very visible and adding all those Anthology scents, too! So this could be one of those occasions where you buy a decant, and a plain perfume bottle that you fancy, and tip the decant into it. Problem solved. I so often wonder who buys all those perfume bottles I see in discount stores and antique shops. Now I know. I know the uniform you speak of and the ribbon and colour of the perfume do remind me of it too! Ah yes, I think you do know. Enough said! Hah. Memory is a funny thing! What do you think about coincidences? 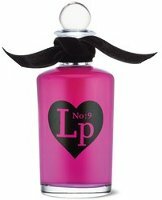 Before opening NST, I chose LP #9 to be my next one to test from Penhaligon’s samples I am trying. I did not like the fragrance, but I appreciate your review, Jessica, and very much so. You brought up fougeres, and yes, there is something in a few fougeres I tried that turns me off, and this is present in LP #9 as well. Its opening also reminds me of some nice fragrances that receive a lot of love, but I cannot wear them — Torrente L’Or, OJ Ta’if, Cacharel Noa. All of them share the opening and it smells really screechy and chemically on me. Mind me, I truly believe that all these are cases of my skin acting funny and transforming otherwise beautiful fragrances into something lesser, and so is the case with LP #9. Warum, I enjoy the drydown of this one more than the fougere-y opening… although I don’t find it similar to Taif… interesting! I am sure that it’s not really similar to Ta’if. It’s just my weird skin picks up and amplifies one big nasty note, whatever it is. What about LP #9, do you like that one? Well, my bottle is on the way. I love the bottle, love the magenta, ( sorry annemarie!) love Bluebell and Violetta, and even though the lemon and cedar notes scare me, that rose/jasmine/carnation heart is right in my wheelhouse. As a bonus, I had some Amazon gift certificates to use up. Please accept my apologies and delete this comment if I shouldn’t have posted that! Meant to add thank you, Jessica, for a lovely review; I think you and Angela are responsible for half my perfume collection! You are welcome — hope you’ll enjoy it! Oh no worries about the magenta! And thanks for mentioning the decant special from THAT online decant service. I’m tempted. Looks like the decants at TPC are a few years old, so there may be a slight difference… but yes, TPC is a great resource. There was something about this fragrance which reminded me of one of the Tuberose (newish) series from Histoires de Parfum (of course I can’t say which one of the three it is, I will have to revisit those). This one is extremely feminine, definitely something I would have worn in the eighties! I always mix up those Histoires, too. But I’m glad to know I’m not the only one who got an 80s “vibe” from this! Very nice review, Jessica, and thanks for not activating the lemming. Sometimes, it’s a relief to read a review and *not* want the fragrance in question, isn’t it?! Penhaligon’s definitely have a lot of surprises in their oeuvre… I can’t recall having heard of this one. I’d be curious to try it, as sometimes the combination of herbaceous-aromatic-floral can work well. I’m thinking that several of the Santa Maria Novella line do the same thing. Joe, I’ve heard the men’s LP is quite nice… and I think that’s a good point, about SMN! Great review, Jessica! I’m not convinced by the notes, but I have to try it, as I know the words to ‘Love Portion No. 9,” beginning to end. Not my favorite song, but when I was little my grandfather would bring me 45 rpm records (ok–please tell me someone out there knows what I mean) that were discards from a jukebox at friend’s business. As a result I listened to a strange mix of current and outdated rock music, starting at about age 6….All of that t say, it would be fun to like this perfume! Oh, I know exactly what you mean… I loved listening to the few 45s we had around the house when I was younger!